Squeeze the lemon and keep it aside. In big bowl boil 3 cups of water . Int the water add turmeric and some salt .Once boil add semiya and cook for 2 -3 minutes. Don't overcook otherwise it will become mushy. Once cooked drain the water completely and run in cold water. Drain the water and allow it to cool. Mean time heat oil in a pan , add mustard seeds , Channa dal,Urad dal, Ground Nut ,curry leaves and red chilli and cook for 3 minutes. 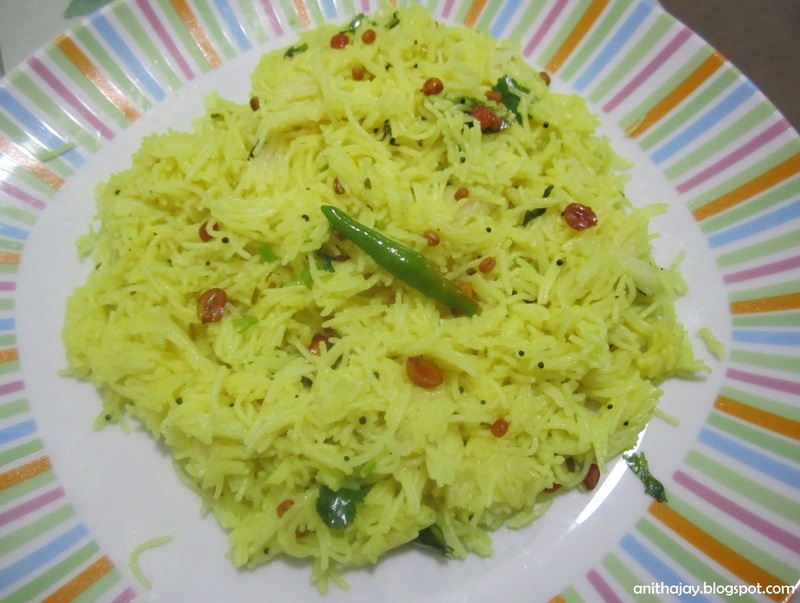 Pour this mixture , lemon juice in dried vermicelli and mix well. super perfect color!!! such a nice breakfast!! Thanks for linking it to my event!! Looking for more yummy recipes! !